FireOne is an audio interface plus DAW controller with shortcut keys and a weighted and illuminated jog wheel to inspire creative interaction with the artist's music. 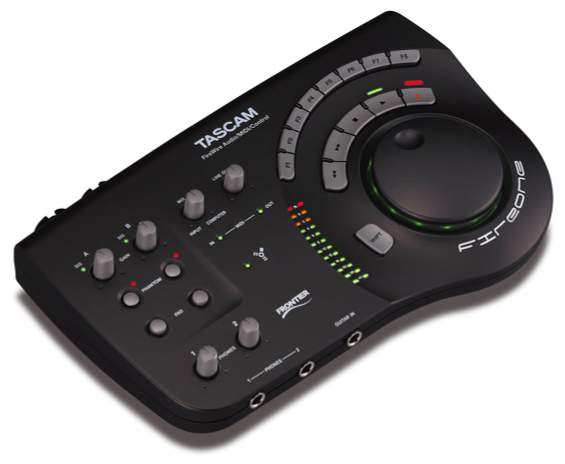 It is the first stereo audio interface in its class that records two mic ins and two outs over FireWire at 96-kHz/24-bit audio resolution. The two mic inputs offer phantom power and pad switches and a front panel guitar input allows convenient direct recording of guitar or bass. MIDI input and output are also provided for 16 channels of MIDI. The most unique feature of the unit is its large, weighted, backlit jog wheel, which allows musicians to zip through their song while the backlight provides useful feedback such as a visual metronome. The FireOne also has transport keys and eight shortcut keys to control functions in most popular DAW applications. Multitrack recording software is supplied as standard, so you'll be set to go right out of the box.